Implementation of IHL – turning the rules into action – is first and foremost the responsibility of the States that are party to the Geneva Conventions and their Additional Protocols. This responsibility is set forth, notably, in Article 1 common to the four Geneva Conventions, which requires States to respect and ensure respect for the Conventions in all circumstances. Some implementation measures will require the adoption of legislation or regulations. Others will require the development of educational programmes for the armed forces as well as the general public, the recruitment and/or training of personnel, the production of identity cards and other documents, the setting up of special structures, and the introduction of planning and administrative procedures. States must also prevent violations and if they occur, punish those responsible for it. States have a duty, in peacetime and during armed conflicts, to take certain legal and practical measures aimed at ensuring full compliance with IHL. IHL treaties also provide for a number of mechanisms to ensure compliance with the law. These rules and mechanisms can be broadly divided into three categories. • Ensuring respect for the red cross, red crescent and red crystal emblems. • Protecting Powers or their substitutes. Protecting Powers are neutral States appointed to safeguard the interests of the parties to the conflict, and their nationals, in enemy countries. The role of the Protecting Power is to conduct relief and protection operations in aid of victims and to supervise compliance with IHL, by visiting prisoners of war or civilian internees, for example. An international organization that ‘offers all guarantees of impartiality and efficacy’ may act as a substitute for a Protecting Power. • Enquiry procedure. An enquiry must be instituted into alleged violations if requested by a party to the conflict and if the parties concerned agree on the procedures to be followed. • International Humanitarian Fact-Finding Commission. This commission, established under Article 90 of Additional Protocol I, may inquire into alleged grave breaches or other serious violations of the Geneva Conventions or Additional Protocol I and facilitate through its good offices the restoration of respect for the Geneva Conventions. Although its formal competence extends only to situations of international armed conflict, the Commission has expressed willingness to conduct investigations in connection with non-international armed conflicts, if the parties consent to it. • Cooperation with the United Nations. In the event of serious violations of IHL, States party to the Geneva Conventions and its Additional Protocols must act in cooperation with the United Nations and in conformity with the United Nations Charter. • ICRC. The ICRC is a key component of the monitoring process by virtue of the mandate entrusted to it under the Geneva Conventions, their Additional Protocols and the Statutes of the International Red Cross and Red Crescent Movement. • obligations between States to provide mutual assistance on criminal matters. These measures serve as an important deterrent against violations. The principal cause of suffering in armed conflicts is inability to respect the law in force, whether for lack of means or political will, rather than the deficiency or absence of rules. 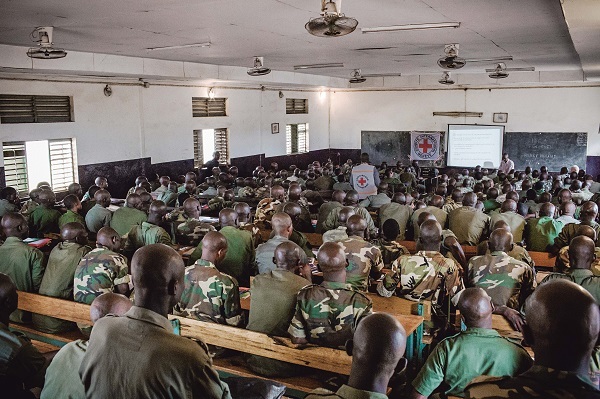 In recent years, the emphasis has been on developing criminal law procedures to prosecute and punish those who have committed serious violations of IHL, but appropriate means for halting and redressing violations when they occur are still lacking. Most of the procedures provided under IHL have not or have almost never been used in practice. What is more, these procedures apply only in cases of international armed conflict. It is true that some monitoring and implementing mechanisms have been developed outside the ambit of IHL, but they have their limitations. For all these reasons, the ICRC believes that the mechanisms for monitoring and ensuring compliance with IHL must be strengthened.